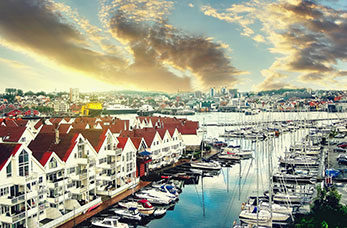 Stavanger is Norway’s fourth largest city and lies at the mouth of the Gandsfjord. The Port of Stavanger is a popular stop on the route to the Norwegian Fjords. The charming city centre is just a small walk from the quay side. The museum was opened in 1999, and this exciting landmark with its unusual architecture is one of the most popular attractions in the port of Stavanger. Old Stavanger comprises of 173 wooden building which is believed to be Europe's largest collection, the majority are small, white cottages. There are galleries and boutiques for you to pick up some local handicrafts. One of the highlights of Norwegian nature is a sightseeing cruise of Lysefjord fjord where you can take in the magnificent surrounding scenery and the famous Pulpit Rock! This catherdral was built in 1125 by Bishop Reinald of Winchester. The cathedral has retained its original appearance and is still being used. Take a trip to the Ullandhaug tower where visitors can access the lower platform which offers panoramic views of the stunning countryside and mountain ranges. Flor og Fjaere Gardens is the northernmost tropical garden in the world, take a walking tour around the lush gardens.